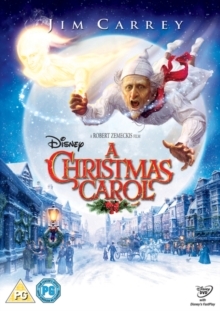 Robert Zemeckis's animated retelling of the popular children's classic, based on the novel by Charles Dickens, featuring the voice talent of Jim Carrey in the multiple roles of Ebenezer Scrooge and the three ghosts which haunt him. Old miser Scrooge is visited by the ghosts of Christmas past, present and future who aim to rid him of his contempt of friendship, love and all things Christmas. In order to do so, the ghosts take him on a journey through time, opening his eyes to the truths he is yet to face and the consequences should he refuse to do so. But in the end it is up to old Scrooge himself to realise the emptiness of his existence and open up his heart before it is too late. The film also features the voices of Gary Oldman, Colin Firth, Robin Wright Penn and Bob Hoskins.